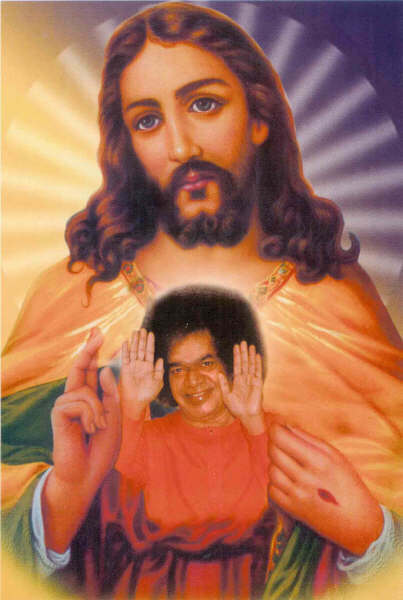 On the occasion of various meetings, one question has been insistently asked from me, which is also a sign of amazement people due to the interest shown by a Catholic priest in the Person of Sai Baba "How is it that you, who received the teaching of Jesus so closely, fell the need to proach another Master." It is a very interesting question, since it is the same as an examination of one's conscience which, at the same time, reveals a common mentality, even though full of confusion. In fact, at least two preconceptions can be deduced from that question, which are largely spread among Catholic upbringing. The first preconception is to believe that a priest, during all his theologica studies, has received a doctrine devoid of conditionings. In two millenia of Christianity, the true teachings of Jesus have been handed down without some kind of interpolations and the Catholic dogma among innumerable controversies. In the dark period of the past, the life of some men and women, who were shining and sanctity, was judged immoral and diabolic. Hence, a discrimination between the doctrines supported by men of worldly mentality and the transcendental truth handed down by the word and deeds of Jesus would not be inappropriate. The second preconception can be deduced from the idea that to turn Baba means "to turn to another Master". The term "another" here means "different" and consequently, as regards faith means "heterodox". We need to point that this second opinion starts from an even more rooted prejudice: many think, without having studied the message of Sai Baba, that it should not be follow that it is even dangerous. "Anything belonging to our tradition is not", they think. The "scandal" of a Catholic following the Sai philosophy arises from these two preconceptions, if it involves a man who was part of the ecclesiastical hierarchy. Anyway, having made these preliminary remarks, which should already represent a sort an answer, the question stays before y cosncience as an examination I have to get through. Therefore, I will try to an answer looking into the innermost part of my heart; that part which has not to give an account to anybody except to God of its own choices, disregarding public opinion. Approaching and meeting Bhagavan Sri Sathya Sai Baba has meant to me the discovery of a revelation which still continues. It is as if the Holy Scriptures, which are available to the people of any culture and religion, had concluded only some chapters and written at the bottom, "to be continued", instead of "the end". If Jesus were still alive (I mean with His physical presence, such as that of any other humari being), surely He would still have many things to tell men. "I still have many things to say to you but they would be too much for you now" (John 16:12), He said to His disciples a short time before leaving this world. Yet, it is right to ask oneself what aroused in me such a great interest in Sai Baba that if could go beyond the one for Jesus. Of course, the figure of Jesus has not been forgotten nor declassed. One cannot throw a ruby away only because one has found a diamond; one cannot deny the Son after recognising the Father. But the question my conscience is being insistently asked is: "What more did I need?" Once more the answer is given by John the evangelist: "When the Spirit of truth comes he will lead you to the complete truth... He will glorify me since all he tells you will be taken from what is mine. Everything the Father has is mine; that is why I said: All he tells you will be taken from what is mine:" (16:13;15). Something had remained in the heart of Jesus and He was waiting for the right time it could be revealed. From my studies of theology, one part was missing, which would enlighten the truths as a whole. The Western doctrine, however interesting a mosaic, rich in colours and images, it may already be in itself, was yet incomplete and inadequate, with large parts bereft of tesserae, so that the whole, unitary meaning of the work was made incomprehensible. It needed to be completed in order to identify the subject of the whole work. In my humble opinion, one of the purposes of Sai Baba's Mission is completing that "mosaic". If I had more space, I would like to expatiate on all those missing parts, giving a clear vision of the whole picture and showing what was missing and I was looking for: the other half of heaven. Before knowing Sai Baba, I didn't give much weight to the power of the mind and to the importance of keeping it under control; I didn't know that the quality of the spiritual journey depended on the physiological and psychological food; I had never been explained the "subtle" influence of good or bad company. The teachings of Jesus, however, are in tune with Baba's. From the Gospels, we can synthesise the virtues necessary to live in purity, prudence, righteousness, fortitude and temperance. The Church has always proposed truth, hope and charity as theological virtues; has always promoted assistance to the starving, the wanderers, the sick, and so on; stresses the importance of comforting the afflicted, forgiving the affronts, being patient with the bothersome persons. I find that the seven deadly sins, listed by the Catholic doctrine, are nearly the same as the ones pointed out by Sai Baba: pride, avarice, lust, anger, gluttony, envy, sloth. All that is taught is undoubtedly good, but it is part of the unfinished piece of mosaic. In fact, if people knew the triple bodily dimension which constitutes the human being (physical, astral and causal) and the influence it exerts over the choices of life, the evangelical precepts would be much more understandable and there would be much more strength in putting them into practice. I can say that Sai Baba brings us continually back to our subtlest dimension, that is the divine one: we are Atman, Spirit. The Atman is an invisible elusive entity. It is not possible to immediately change from a gross an material dimension to the absolute transcendent one. The way baba show is gradual: to change from the state o mortality to the state of immortality, first o all it is necessary to put aside one' material interest, then refine them an finally sublimate them up to the state tha enables one to be continually blissful. Will one life be sufficient to express gratitude to this Divine Dictor who gives like back? Bowing and kneelng down on front of the Gooness and Compassion of Lord Sai, I offer to the brothers this humble thougt. Author of "A Catholic Priest meets Sai Baba"